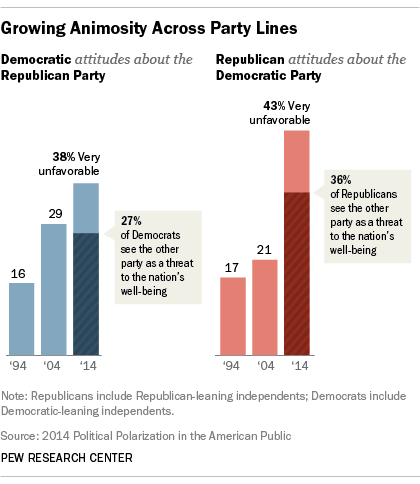 2 Partisan antipathy has risen. The share of Republicans who have very unfavorable opinions of the Democratic Party has jumped from 17% to 43% in the last 20 years. Similarly, the share of Democrats with very negative opinions of the Republican Party also has more than doubled, from 16% to 38%. But these numbers tell only part of the story. Among Republicans and Democrats who have a very unfavorable impression of the other party, the vast majority say the opposing party’s policies represent a threat to the nation’s well-being. 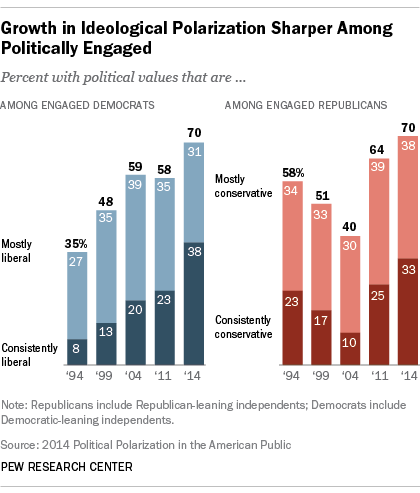 6 The most ideologically oriented Americans make their voices heard through greater participation in every stage of the political process. Self-reported voting rates are higher among those on the right than the left, but higher among those on the left than in the middle. Political donation rates are roughly double the national average among ideologically consistent liberals (31% have donated money) and conservatives (26%).